Proof Native American Dollars have been issued for each year of the series. These coins have been struck at the San Francisco Mint and carry the “S” mint mark, which appears within the incused edge lettering. As with all modern proof coinage, the coins feature a cameo finish with frosted raised design elements and mirrored background fields. Following the format of the series, each year a unique reverse design has been used to represent the contributions of Native Americans to the development and history of the United States. This has been paired with the static obverse design featuring the portrait of Sacagawea and child designed by Glenna Goodacre. The proof issues of the series have been incorporated into the annual Proof Set and annual Silver Proof Set offered by the United States Mint. The proof coins have not been offered separately or within any other products. As such, the mintage levels for the Proof Native American Dollars have been driven by the total sales volume for the annual proof sets. The current mintage low is held by the 2012-S proof at 1,237,415 pieces. 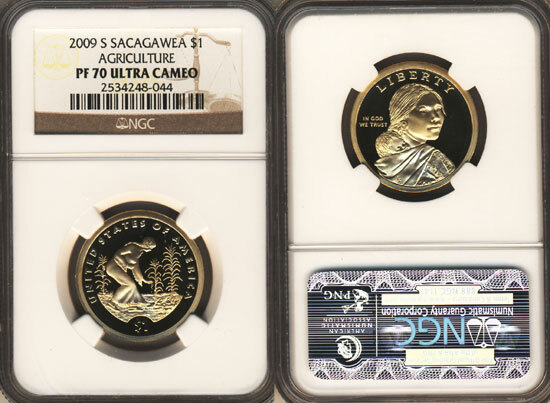 Collectors may acquire the proof coins within the original sets of issue or individually from sets that have been broken up. Some collectors may also seek to acquire examples of the coins that have been encapsulated and graded by third party grading services such as PCGS and NGC. The coins graded PCGS PR70DCAM and NGC PF 70 Ultra Cameo are considered the finest available and command premiums.